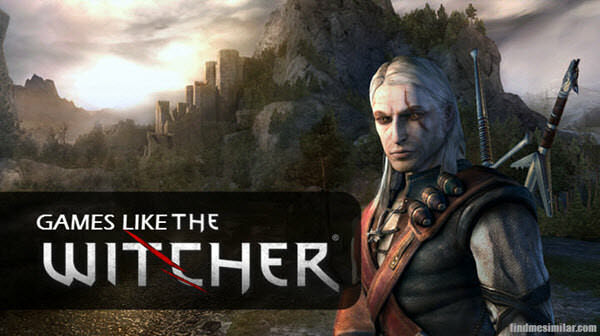 Games Like The Witcher: Fantasy RPGs '+g+"
Like playing action adventure fantasy RPG games like The Witcher? Check this list of recommendations below for games similar to The Witcher. The Witcher is a series of hack and slash dark fantasy RPG games developed by CD Projekt RED and published by Atari, Inc. The games are based on a series of Polish novels by Andrzej Sapkowski. Set in medieval fantasy world the story follows the adventures of Geralt of Rivia, one of the last Witchers (professional monster slayer) with supernatural abilities. Obviously, it goes without saying that the games most like The Witcher are the sequels, so they are not included in the list try them if you haven’t already and don't forget to mention if we miss any games that are similar to the Witcher as we keep on updating this list. Dragon Age is a dark-fantasy medieval role playing games developed by BioWare. It is considered to be the spiritual successor to BioWare's "Baldur's Gate". Gothic is a series of open ended action role-playing games set in medieval fantasy world. The game follows the adventures of a nameless hero. Neverwinter Nights 2 is a fantasy role-playing game developed by Obsidian Entertainment. This is a sequel to Bioware's Neverwinter Nights set in the universe of Dungeons and Dragons. The player starts the journey as an peasant and rises to a full-fledged hero of the Realms by explore the world, earning experience and treasure by completing quests. Risen is a fantasy-themed action RPG developed by Piranha Bytes and published by Deep Silver. The player takes control of an unnamed hero who survives a shipwreck and is stranded on a tropical island called Faranga which is full of fantasy creatures and ancient temples ruins risen from the ground. Mass Effect is a series of science fiction action role-playing third person shooter video games developed by BioWare and released for the Xbox 360, PlayStation 3 and Microsoft Windows, with the third installment also released on the Wii U. The series has been a major critical and financial success. All three games have received critical acclaim for their storyline, characters, romances, voice acting, choices and the depth of the galaxy. Dungeon Siege,....if you can think of more games then don't forget to mention it in comments.